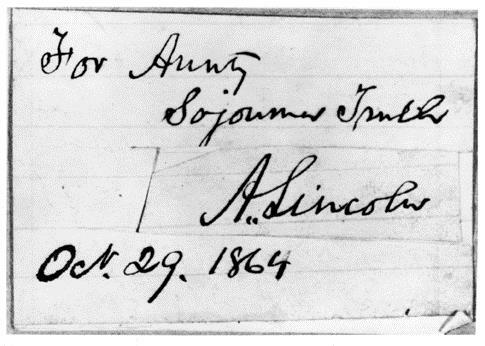 October 29, 1864. Franklin C. Counter’s 1893 painting remains the emblematic image of the moment when one of the nation’s most famous abolitionists paid her respects to the man who wrote the Emancipation Proclamation. Although this heartwarming story has become part of our national memory, there is significant evidence that much of it is false. Historian and Truth biographer Nell Irvin Painter also notes that Lincoln’s statement “I had heard of you many times before that” was added to the account by a later editor of her autobiography. More damning are the words of Truth’s companion, Lucy Colman, who in 1893 noted tartly that she and Truth had to wait three and a half hours while Lincoln chatted and joked with a variety of white male visitors. When he finally turned to greet the women his demeanor hardened. “He called her ‘Aunty’ . . . as he would his washerwoman.” Colman recalled. When Truth complimented Lincoln as the first anti-slavery president, Colman says he snapped, “I’m not an Abolitionist; I wouldn’t free the slaves if I could save the Union any other way — I’m obliged to do it.” After a brief conversation, Lincoln ushered the women out. Historians continue to debate what actually happened. While pointing out that Truth’s accounts of her life varied and that she was regularly “edited” by her white sponsors, scholars also regard Colman’s account as unreliable. After all, emancipation was settled policy by the fall of 1864, black troops were in the field, and during his reelection campaign Lincoln had publicly called for a constitutional amendment eliminating slavery. We’ll never know the whole story. Colman, a militant abolitionist, had little use for Lincoln’s slowness in taking action on slavery and his alleged brusqueness may have been a response to her, not Sojourner Truth. The fact remains that he did give Truth his autograph. 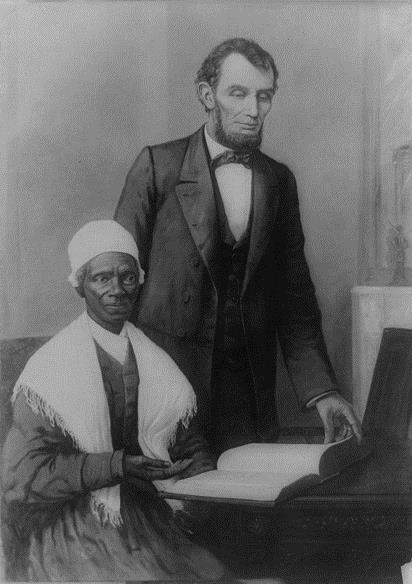 Steve Coates, “Abraham Lincoln and Sojourner Truth,” The New York Times, October 29, 2010.